Local and national forms, local rules of court and general orders and federal rules are available to the left. For lawyers, all pleadings, motions, memoranda, or other filings shall be created via personal computer with a word processing application, e.g., Microsoft Word® or Corel WordPerfect®, then converted to portable document format (.pdf). See, LRCiv 7.1(c) and definition of “.pdf,” ECF Manual, at I(A), p. 2. (“[E]lectronic documents must be converted to .pdf directly from a word processing program (e.g., Microsoft Word® or Corel WordPerfect®) and must be text searchable.”). Such filings shall not be printed to paper and then scanned and saved as portable document format (.pdf). Documents which exist only in paper form, like exhibits or certain attachments to pleadings may, however, be scanned from a paper copy and saved in a portable document format (.pdf). When specific relief is requested in a motion, the attorney or party must lodge with the Clerk a separate proposed order except for a motion to dismiss or a motion to summary judgment pursuant to Federal Rules of Civil Procedure 12(b) or 56. LRCiv.7.1(b)(2). b. incorporate by reference, but rather must set forth the relief requested or the terms of the parties’ stipulation. d. be included as an attachment to the motion or stipulation. When consenting to a MJ or electing to proceed before a DJ, do not electronically file the consent/election form. LRCiv 3.8(a) Consent/election forms are to be filed in paper form with the Clerk’s Office. LRCiv 5.5(b) (incorporates ECF Administrative Manual) (ECF Policies and Procedure Manual, II, ¶ N at p.24). 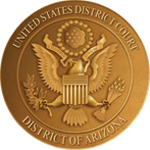 When a settlement conference, discovery dispute, garnishment proceeding, or any other matter is referred to a MJ by the assigned DJ, “counsel shall immediately provide a copy of any filed document relating to the referred matter to the chambers of the referred Magistrate Judge.” LRCiv 40.2(d). Note: most, if not all, MJs do not want settlement conference memoranda filed; use judge’s chamber’s email box. 1 Local rules are “laws of the United States,” United States v. Hvass, 355 U.S. 570, 575 (1958), “have the force of law[,] are binding upon the parties and upon the court, and a departure from local rules that affects substantial rights requires reversal.” Professional Programs Group v. Department of Commerce, 29 F.3d 1349, 1353 (9th Cir. 1994) (internal quotation marks omitted). “A departure is justified only if the effect is so slight and unimportant that the sensible treatment is to overlook [it].” Id. Significantly, the district court is under an obligation to construe local rules so that they do not conflict with federal rules and statutes. Marshall v. Gates, 44 F.3d 722, 725 (9th Cir. 1995); Rule 83(a)(1), Fed.R.Civ.P.